How important is mounting from both sides when starting a young horse? I have been following the Jac series to help me with training my 3 y/o mare. I started in January and am so happy with how she’s been doing. I have just started mounting her today, but am actually having trouble mounting from both sides, it’s a bit awkward for me, and I didn’t think to practice on a broke horse first. My question is do you think I should skip this part and just slowly move her head to the other side when I switch directions (stopping first), or should I wait and practice on a broke horse? She is very quiet and I have sat on her a couple times last year without issue. 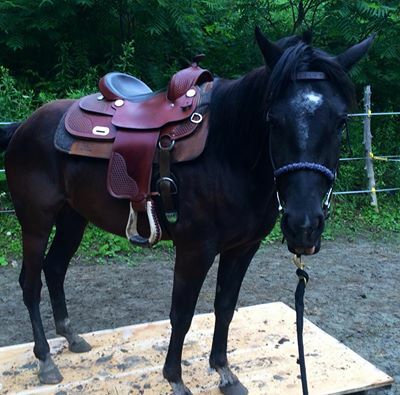 How important is mounting from both sides, and do you have an alternative method for switching sides at the beginning?”-Liseanne R.
I am so glad that the series has helped you and your horse! Mounting from the ‘off’ side can be awkward. There have been times that I have gotten out of the habit of mounting from the ‘wrong’ side and I remember that it does take some time to get comfortable with it again. To prevent this I mix up the side that I mount and dismount from on all my horses; I might mount the right side and then dismount from the left, or mount and dismount once from the left and the next time from the right. You have already identified the best method for getting comfortable with it again, which is practicing on a broke horse first. 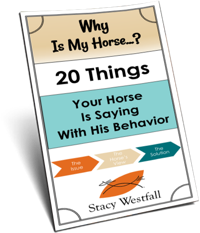 I mount and dismount for a few reasons but, beyond keeping the horse balanced and exposed on both sides, the main reason is because a horse that is bending can’t buck as well as one that is straight. When I bend, mount and move the horse bent I am preventing bucking. Watch a bucking bronc and you will see the head is straight in front. This shows me that they buck best when straight. I mount and dismount for many reasons but bending to prevent bucking is a big one. There are other ways to discourage bucking. Just last week a friend asked me to pony her while she rode her three year old filly. She had done all the groundwork but wanted to have the filly move out more. I rode her big gelding and lead, or ponied, her while she rode. As the person ponying I was in control of the speed and direction but even more importantly I could discourage bucking by controlling the fillies head. In essence I was preventing or discouraging bucking. This would be another example of a possible method. The fun thing about training horses is that there are so many choices and each horse is an individual. It sounds like you have done your groundwork well and that you know your horse. Part of all that groundwork was so that you could gather information for future decision making. Think back to her worst reaction to a new thing and compare that, making an educated guess, to this new question. It sounds like you are a thinking rider; you have identified the potential problem, you know what would remedy it and you have considered alternatives. This leads me to believe that you will make a good decision and no matter what happens you will learn from the outcome. Great job! Teeny-tiny point: always mounting and dismounting from the near side stretches the stirrup leather, and after a while you can’t get them even. Alternating sides prevents this. Yep! Completely true. Equine chiropractors also recommend alternating sides as the same ‘pull’ affects the muscles in the horse! 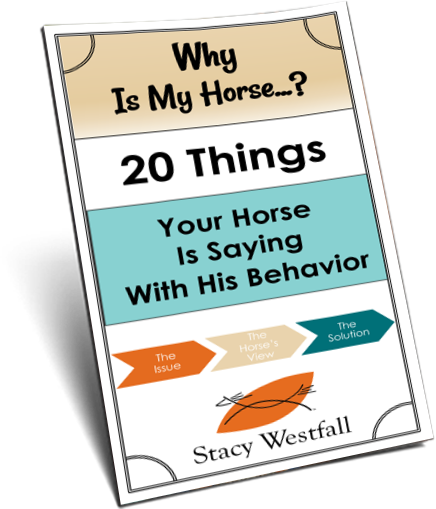 Stacy Westfall took the time to write a blog to answer some of my training questions! I am so honored! Thank you so much Stacy!